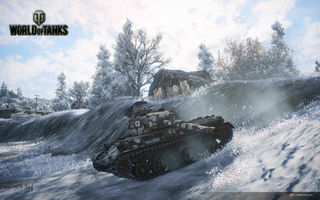 The Type 61 is a Japanese tier 9 medium tank. 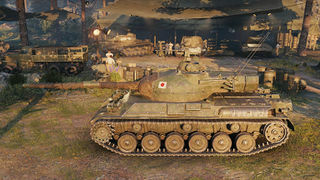 Similar to its predecessor in multiple aspects, the Type 61 needs to keep its distance from the middle of the action as much as the STA-1 needed to (or even more). 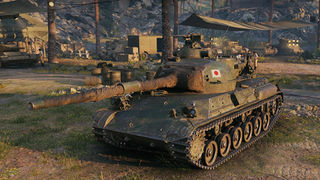 Paper-thin armor won't be surprising for Japanese medium tank drivers, however the lack of camouflage makes this tank significantly harder to play than its smaller tier 8 brother. You certainly don't want to expose yourself or get engaged in close combat by much better armored enemies, so stay back, and make good use of cover, at least in the first couple of minutes of the battle. This way you can take advantage of your nice DPM and conserve HP for the endgame. 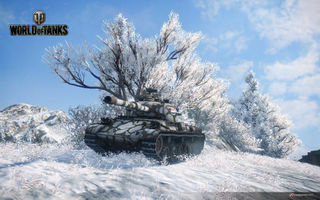 Keep in mind that the Type 61 tends to quickly become a primary target on the battlefield, due to its non-existent armor, dangerous alpha, and raw DPM potential. And driving a primary target that gets spotted quite easily may not be much fun, if you're not paying attention. 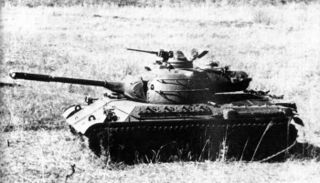 The Type 61 leads to the STB-1. "Proceed with caution". It's the main motto of every good Type 61 driver. Due to its bad camo value and miserable armor, you're forced to rely on using cover as much as possible. In the first half of the battle, try to stay behind the heavies and other mediums, and support them with your dangerous, though sometimes tricky-behaving gun. You have the mobility to change position often and swiftly, and make good use of the superior gun depression. Try to avoid close-combat though, since every incoming shot will hurt you badly, not mentioning the frequent module and crew damage. Once the heat of the battle settles down a bit, you can move up to surprise and execute busy enemies with some flanking guerrilla action. 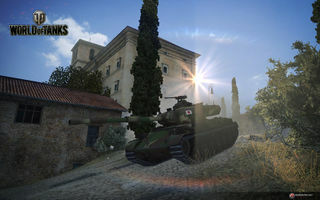 Remember, Type 61 is neither a brawler, nor a decent scout, and will almost never come out on top in melees with other tier 9 mediums. After World War II, Supreme Commander of the Allied Powers (SCAP or aka GHQ in Japan) ceased all military manufacturing and development plants in Japan, resulting in Japan losing the technology needed to build and manufacture tanks and armored vehicles. However, due to the Korean War, SCAP ordered Japan to re-militarize, forming armed police forces (National Police Reserve, later called National Security Force, then finally Japan Ground Self Defense Force) and provided M4A3E8 Sherman and M24 Chaffee tanks. However, the average height of a Japanese person at the time was too small for the M4A3E8, and drivers had difficulty reaching the clutch pedal with their foot. In addition, the M4 was becoming obsolete. The M24, though it was popular amongst the Japanese crews, was inadequate when facing Soviet T-34/85s, as seen in Korea. 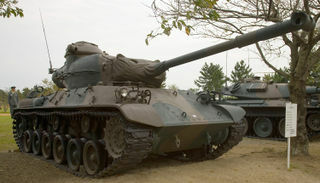 Thus, as the tanks in JGSDF service at the time were obsolete/inadequate, the JGSDF was provided with the option of either purchasing the new American built M46 Patton and later, the M47 Patton or develop their own MBT in 1954. 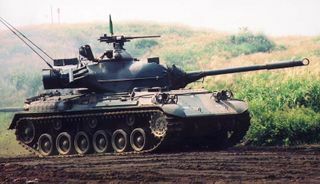 Due to the high cost of purchasing American made tanks, and because the M47 did not meet their requirements, the JGSDF decided on developing their own main battle tank, resulting in the development of the Type 61. In order to effectively use a small number of tanks to cover up a large area, the size and weight of the tank has to be light enough for trains to carry. Due to the above target, the weight of the armour has to be limited around 25 tons yet as heavily armoured as possible. Main cannon has to be 90 mm. The weight was one of the main concerns since if the first constraint was met, the tank could also be transported by a specially modified truck through most major highways and tunnels in Japan. The second constraint couldn't be met due to the mock up development team finding out that the armour would be too thin to protect the vehicle. As a result, the armour weight constraint was raised to 35 tons for a while. However, due to a delays in the production of the planned diesel engine, the tank did not have enough power to attain good mobility. As a result the weight of the armour was reduced. 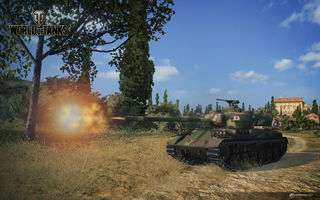 The final constraint was due to the light body build of Japanese people at that time, after examining the M36 Jackson, 90 millimeter ammunition was felt to be the upper limit of what an average Japanese tanker could handle effectively. Additionally due to the mountainous landscape of Japan, it was unlikely that long range engagements would occur frequently and it was thought that a 90 millimeter gun would be sufficient. The initial production rate was low, with only ten tanks produced in 1961 and 1962, increasing to twenty in 1964 and thirty in 1965 and 1966. A total of 250 had been produced by 1970, with production continuing at an increased pace until 1975 when it was terminated. A total of 560 were produced. 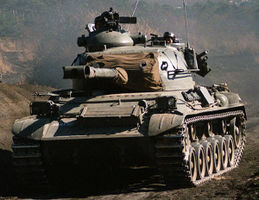 The tanks were phased out of service in the 1990s with 400 in service in 1990, and 190 in service in 1995. All were decommissioned by 2000, 39 years after their original deployment. During this period, the type 61 received minor upgrades in the form of infra red searchlights and/or smoke dischargers. From 1980, Type 61's began to be supplemented by the more modern Type 74 MBT. Armor scheme of the Type 61. The armor thickness was roughly the same throughout all of the STA prototypes. 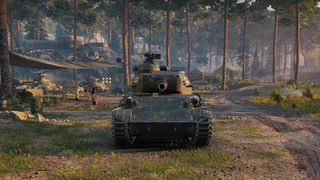 * Certain points of the frontal hull armor reached up to 90 mm, though in-game the thickness is at most 45 mm for the upper glacis and 50 mm for the lower glacis. The 105mm gun configuration is fictitious.